Toronto Maple Leafs prospect Mac Hollowell (17, 18, 19) closed out the weekend with his first OHL hat-trick, bringing the Soo Greyhounds back from a 2-0 deficit to defeat the Oshawa Generals 3-2 in overtime. Hollowell struck twice in the second period, with the latter of those two goals knotting the score at two with 41 seconds left on the clock. 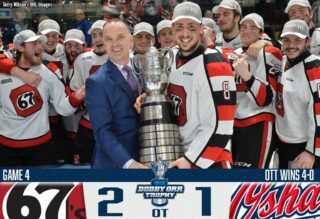 Hollowell’s overtime winner came with assists from Morgan Frost and Barrett Hayton as he snuck a shot past Oshawa’s Kyle Keyser coming out of the corner. 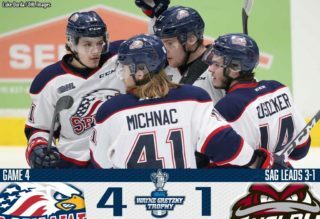 Serron Noel (26) and Brandon Saigeon (33) scored Oshawa goals while Kyle Keyser made 32 saves, helping the Generals earn a point in the overtime loss. Sault Ste. Marie’s Matthew Villalta made 32 saves, improving to 24-7-4-0 on the season. The Hounds improve to 33-11-5-1, pulling to within six points of first place London in the Western Conference. 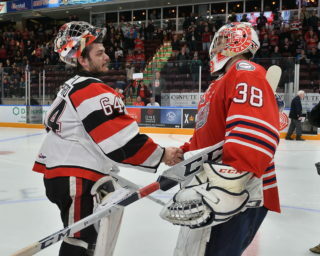 Oshawa drops to 30-18-3-0, earning a point to sit tied for third with the Sudbury Wolves in the Eastern Conference. The Sarnia Sting rallied back from a 4-2 deficit, scoring twice in the final three minutes of regulation to force overtime where Hugo Leufvenius (29, 30) scored his second of the night for the game winner. Leufvenius finished with two goals and an assist in the 5-4 road win over the North Bay Battalion while overage defenceman Mitch Eliot (14) tied the score with a blast from the point with 1:01 remaining in the third period. 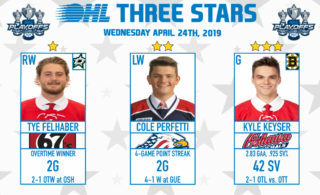 Curtis Egert (12) and Jacob Perreault (25) also scored for Sarnia while Ryan McGregor extended his point streak to eight games, picking up a pair of assists. Ethan Langevin made 29 saves for the win while North Bay goals came from Brandon Coe (11), Simon Rose (3), Justin Brazeau (45) and Harrison Caines (5). Brazeau’s 112th career goal pushed him ahead of Raffi Torres and into fourth on the Battalion all-time list. Sarnia rebounds from a loss on Saturday to improve to 22-23-5-2 for sixth place in the Western Conference. North Bay earns a point but suffers a third straight loss, falling to 23-24-3-1.